It was registration day at the 1st Interim International Rock Garden Conference in Seattle, Washington, in July 1976. After completing my registration, I was drawn to a table full of colorful garden magazines called Pacific Horticulture. Standing behind the table was a dapper Englishman by the name of W. George Waters, the editor of the magazine, which had just begun publishing in January of that year. On learning that I was planning a move from Ann Arbor, Michigan to San Francisco, George immediately sold me a subscription to the magazine and offered the first three issues to take home. I was hooked. It would never have occurred to me that I might eventually succeed George as editor of Pacific Horticulture. Born and raised in the UK, George spent most of his childhood in Degenham, a company town east of London. He never understood why his parents gave him the first name of Walter, and chose to be known by George throughout his life. His parents were working class folk, and his own formal education ended when he was fourteen. He moved through a number of jobs, receiving on-the-job training in science, engineering, teaching, and debating. Eventually, he took a position with Kodak as a research chemist, helping to develop and refine photographic printing processes. George loved gardens as a child, often riding his bicycle to visit gardens and gardeners. That love continued through adulthood and resulted in his creating a number of gardens around his several homes. He was a founder of the Garden History Society and active with various local horticultural organizations, including the Iris Society. Through the last, he met Olive Rice, then a resident of Berkeley, California and an active member of the American Iris Society. He moved to Berkeley in 1972 and the two married soon after. Once in California, George immersed himself in the Bay Area’s horticultural scene. Recognizing the need for a West Coast-based garden magazine, representatives from California Horticultural Society, Strybing Arboretum Society, and Western Horticultural Society had begun exploring the possibility of sponsoring such a publication through the newly created, nonprofit Pacific Horticultural Foundation (PHF). 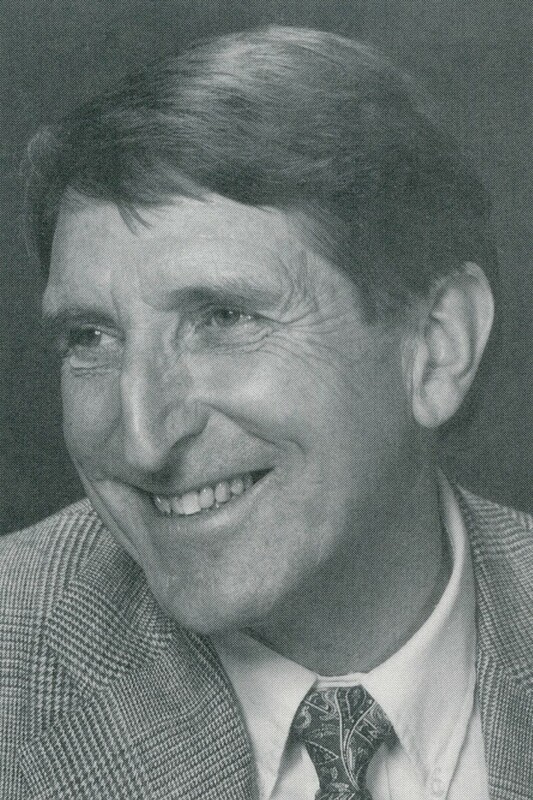 George served on the publications committee planning the new journal, and took on the role of editor as the first issue was going to press in late 1975. Thanks to the strong guidance and support of board member Margedant Hayakawa, the editorship became a full-time paid position. George continued in that role for twenty-one years. I escaped the Michigan climate by moving to San Francisco in September 1977. George and I crossed paths again at a lecture he gave to the Strybing Arboretum Society on the history of Pacific Horticulture. I met his wife Olive at Cal Hort meetings, and the three of us carried on lively conversations about our shared love for bearded irises and about the challenges of gardening in a mediterranean climate, so different from that of the UK (for George) or the Midwest (for Olive and me). I represented Strybing Arboretum Society on the PHF board of directors for four years in the mid-80s. Serving on the travel committee and the strategic planning committee, I came to understand the dedication that both George and Olive had for the magazine. 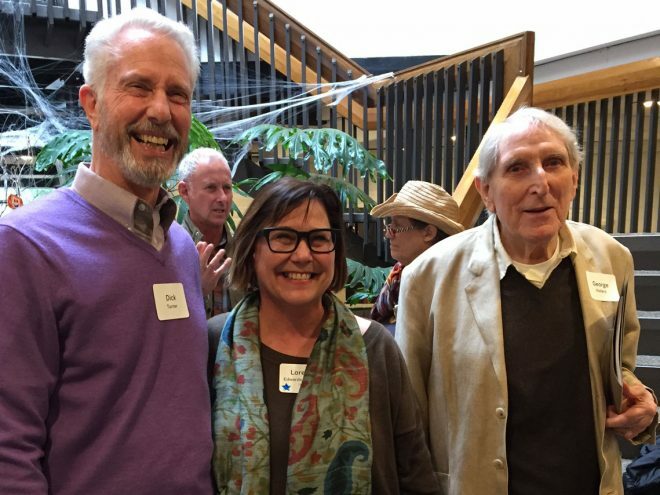 Our paths crossed frequently, as we served on a number of advisory boards and committees together, including those for the San Francisco Landscape Garden Show and the Ruth Bancroft Garden, the first project of the Garden Conservancy. In all of these ventures, I found George to be the most generous and supportive of participants, always finding the most encouraging manner in which to comment on ideas and plans put forth. As an editor, he was particularly appreciated for his communications with those contributing articles and photographs for the magazine. His constructive criticisms helped many a writer and garden photographer reach higher levels of accomplishment, in turn strengthening the growing international reputation for Pacific Horticulture. To fill the pages of the magazine in its early years, George often accepted articles from his horticultural chums in the UK; at times, he wrote those articles himself (often under the pseudonym of Adam Broadbent). 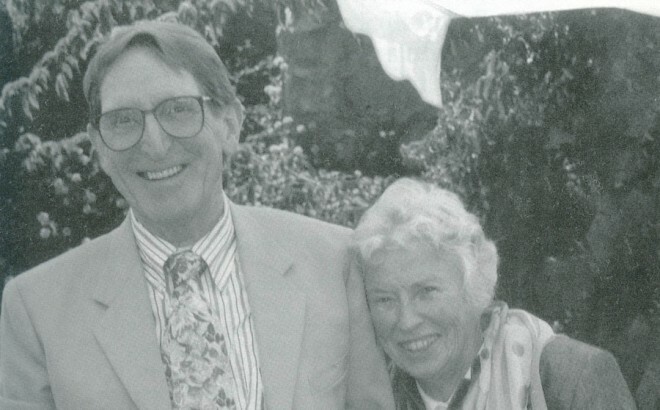 Over the course of his twenty-one years as editor, George molded Pacific Horticulture into both the voice of and inspiration for the West Coast gardener. He built a body of literature by some of the finest horticulture writers on the West Coast*, among them Lester Hawkins, Russell Beatty, Carol Greentree, Faith Mackaness, Elizabeth de Forest, Chuck Kline, Harland Hand, Elizabeth McClintock, Nevin Smith, Roy Davidson, Roger Raiche, and Dennis Thompson. Each explored the opportunities and limitations for gardening in some version of the summer-dry mediterranean climate unique to the West Coast. When George announced his well-deserved retirement from the editor’s desk in the summer of 1996, I made the bold move to apply for the position, recognizing that I would be filling some rather large shoes. Only after meeting with George in his home office on my first day as the second editor of the magazine did I realize how large those shoes were. I could not, however, have asked for a better mentor. In addition to answering my steady stream of questions, George continued to help fill the pages of the magazine with occasional articles and a steady stream of book reviews. Our paths last crossed in October 2016, at a weekend-long symposium hosted by Pacific Horticulture Society in Santa Rosa, California. George had been invited to attend, and appeared on day one, just as dapper as when I first met him forty years earlier. At the age of 91, he was living in a nearby retirement community where he helped maintain the complex’s gardens. He was also writing mystery novels and having great fun doing so. George was delighted to be the center of attention, if only for a brief moment, and to be photographed with his successors. It was an honor for both Lorene and me to share the limelight with this gracious gentleman, without whom there would likely not have been a magazine of the caliber of Pacific Horticulture for either of us to edit. Left to right: Pacific Horticulture editors, Richard G. Turner, Jr., Lorene Edwards Forkner, and George Waters, in 2016. During George Water’s tenure as editor, I published six articles in Pacific Horticulture, from 1977 to 1994. In his uniquely affable British way, George was always open to suggestions for articles. My ideas were not necessarily about horticulture per se, but were topics that he thought would be of interest to the magazine’s readers. My earliest article, “Browning of the Greensward” (1977), was published on the heels of the California drought in 1976-77. My last under his editorship was “Garden Earthworks” (1994), an article on rammed earth construction for gardens, clearly not a horticultural topic but relevant to the craft of garden making. In between, he welcomed and, in fact, encouraged other articles that were not specifically horticultural—articles on garden history and urban forestry—that broadened the scope of subjects typically found in the magazine. George often visited me at UC Berkeley to persuade me to submit an article, recommend other possible contributors, or simply to talk about the magazine and gardening. George had a wry sense of humor and laughed easily during our conversations in my office or at his home in Berkeley. I always felt appreciated for my contributions by George and by his devoted wife Olive. At local symposia or conferences, George often appeared in the audience when I made presentations and asked pointed questions, not so much to play the “devil’s advocate,” but to draw out answers that might clarify the message for the audience. I think he found these meetings inspirational, helping him better understand the important and timely topics, in particular the horticultural implications of the several drought periods in California. As a good editor would, I think he also was checking out the lineup of speakers for possible contributors to the magazine. Under George’s leadership and tireless efforts to seek out writers, Pacific Horticulture became a truly exceptional, high quality journal that was well known not only in California and the West, but also nationally and internationally. Through his background and experience at Kodak, he introduced and insisted on high quality color photography to illustrate the articles and to grace the cover of the magazine. This not only created a top-quality production, but also helped encourage writers to become a part of such an exceptional publication. He was a sharp-eyed editor who insisted on good writing and a literary style that would appeal to readers. But, it was the photography that made the magazine soar. For me, as both an academic teaching landscape architecture and a writer trying to reach a wider audience, it was always gratifying to work with George, whose magazine was of such high quality that it was avidly read by a sophisticated and knowledgeable gardening public.